A collection of pure cultures isolated from the sub-ice algae-bacterial communities inhabiting the lower ice surface of Lake Baikal was obtained. The differences in morphology of the cultured bacteria and their enzymatic activities were revealed by the methods of classical microbiology. The taxonomic affiliation of several cultures was determined by the 16S rRNA gene sequencing. They belong to the genera Pseudomonas putida, P. psychrophila, Methylobacterium extorquens, Rhodococcus aerolatus, Brevundimonas aurantiaca, B. vesicularis, Sphingomonas subarctica, Roseomonas frigidaqua, and Janthinobacterium lividum. These taxa are adapted to low-temperature environments. Azam, F. (1983). The ecological role of water-column microbes in the Sea. Mar. Ecol. Prog. Ser., 10, 257–263. Azam, F., Malfatti, F. (2007). Microbial structuring of marine ecosystems. Nature Reviews Microbiology, 5(10), 782–791. Bashenkhaeva, M.V., Zakharova, Yu.R., Galachyants, Yu.P., Petrova, D.P., Khanaev, I.V., Likhoshway, Ye.V. (2015). Sub-ice microalgal and bacterial communities in freshwater Lake Baikal, Russia. Microb. Ecol., 70(3), 751–765. Bashenkhaeva, M.V., Zakharova, Yu.R., Galachyants, Yu.P., Khanaev, I.V., Likhoshway, Ye.V. (2017). Bacterial communities during the period of massive under-ice dinoflagellate development in Lake Baikal. Microbiology, 86(4), 524–532. doi: 10.1134/S0026261717040038. Bondarenko, N.A., Timoshkin, O.A., Röpstorf, P., Melnik, N.G. (2006). The under-ice and bottom periods in the life of Aulacoseira baicalensis (K. Meyer) Simonsen, a principal Lake Baikal alga. Hydrobiologia, 568, 107–109. doi: 10.1007/s10750-006-0325-7. Cavicchioli, R., Siddiqui, K.S., Andrews, D., & Sowers, K.R. (2002). Low-temperature extremophiles and their applications. Current Opinion in Biotechnology, 13(3), 253–261. Christner, B.C., Skidmore, M.L., Priscu, J.C., Tranter, M., & Foreman, C.M. (2008). Bacteria in subglacial environments. Psychrophiles: from biodiversity to biotechnology, 51–71. Coleman, A.W. (1980). Enhanced detection of bacteria in natural environments by fluorochrome staining of DNA. Limnology and Oceanography, 25(5), 948–951. Cota, G.F. (1991). Ecology of bottom ice algae: II. Dynamics, distributions and productivity. J. Marine Syst., 2, 279–295. De Maayer, P., Anderson, D., Cary, C., & Cowan, D.A. (2014). Some like it cold: understanding the survival strategies of psychrophiles. EMBO Reports, e201338170. D'souza, N.A., Kawarasaki, Y., Gantz, J.D., Lee, R.E., Beall, B.F.N., Shtarkman, Y.M., & McKay, R.M.L. (2013). Diatom assemblages promote ice formation in large lakes. The ISME Journal, 7(8), 1632–1640. Feller, G., Narinx, E., Arpigny, J.L., Aittaleb, M., Baise, E., Genicot, S., & Gerday, C. (1996). Enzymes from psychrophilic organisms. FEMS Microbiology Reviews, 18(2-3), 189-202. Galazy, G.I. (1993). Atlas ozera Bajkal. Moscow, Ruscartography (in Russian). Garrity, G.M., Bell, J.A., & Lilburn, T. (2005). Bergey’s Manual of Systematic Bacteriology. US: Springer. Gilbert, J.A., Hill, P.J., Dodd, C.E., & Laybourn-Parry, J. (2004). Demonstration of antifreeze protein activity in Antarctic lake bacteria. Microbiology, 150(1), 171–180. Gorbenko, A.Yu., Dzyuban, A.N., Krylova, I.N. (1992). Absolyutnyj kolichestvennyj uchet bakterij v donnyh otlozheniyah. Mikrobiologiya, 61(6), 1082–1086 (in Russian). Granin, N.G., Jewson, D.H., Gnatovsky, R.Y., Levin, L.A., Zhdanov, A.A., Gorbunova, L.A., ... & Mogilev, N.Y. (2001). Turbulent mixing under ice and the growth of diatoms in Lake Baikal. Internationale Vereinigung fur Theoretische und Angewandte Limnologie Verhandlungen, 27(5), 2812–2814. Hall, T.A. (1999). BioEdit: a user-friendly biological sequence alignment editor and analysis program for Windows 95/98/NT. Nucleic Acids Symposium Series, 41(41), 95–98. Hébraud, M., Potier, P. (1999). Cold shock response and low temperature adaptation in psychrotrophic bacteria. 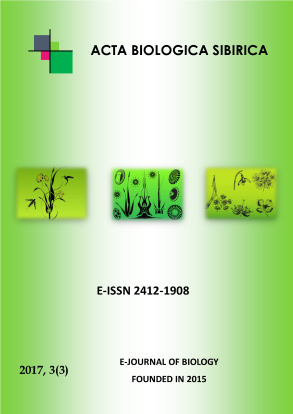 J. Molecular Microbiology and Biotechnology, 1(2), 211–219. Jewson, D.H., Granin, N.G., Zhdanov, A.A., Gorbunova, L.A., Bondarenko, N.A., & Gnatovsky, R.Y. (2008). Resting stages and ecology of the planktonic diatom Aulacoseira skvortzowii in Lake Baikal. Limnology and Oceanography, 53(3), 1125–1136. Jewson, D.H., Granin, N.G., Zhdanov, A.A., & Gnatovsky, R.Y. (2009). Effect of snow depth on under-ice irradiance and growth of Aulacoseira baicalensis in Lake Baikal. Aquatic ecology, 43(3), 673–679. Jewson, D.H., & Granin, N.G. (2015). Cyclical size change and population dynamics of a planktonic diatom, Aulacoseira baicalensis, in Lake Baikal. European journal of phycology, 50(1), 1–19. Kim, M.S., Baik, K.S., Park, S.C., Rhee, M.S., Oh, H.M., & Seong, C.N. (2009). Roseomonas frigidaquae sp. nov., isolated from a water-cooling system. International journal of systematic and evolutionary microbiology, 59(7), 1630–1634. Marmur, J. (1961). A procedure for the isolation of deoxyribonucleic acid from micro-organisms. J. Molecular Biology, 3(2), 208–218. physiological diversity of microorganisms isolated from a deep Greenland glacier ice core. Applied and Environmental Microbiology, 70(1), 202–213. Netrusov, A.I., Egorova, M.A., Zakharchuk L.M. et al. (2005). Praktikum po mikrobiologii: Uchebnoe posobie dlya studentov vysshih uchebnyh zavedenij. Moscow, Izdatel'skij centr «Akademiya» (in Russian). Nohynek, L.J., Nurmiaho-Lassila, E.L., Suhonen, E.L., Busse,, H.J., Mohammadi, M., Hantula, J., ... & Salkinoja-Salonen, M.S. (1996). Description of Chlorophenol-Degrading Pseudomonas sp. Strains KF1T, KF3, and NKF1 as a New Species of the Genus Sphingomonas, Sphingomonas subarctica sp. nov. International Journal of Systematic and Evolutionary Microbiology, 46(4), 1042–1055. Obolkina, L.A., Bondarenko, N.A., Doroschenko, L.F., Gorbunova, L.A., Molozhavaya, O.A. (2000). O nahodke kriofil'nogo soobshchestva v ozere Bajkal. Doklady Akademii Nauk, 371, 815–817 (in Russian). Pomazkina, G.V., Belykh, O.I., Domysheva, V.M., Sakirko, M.V., Gnatovsky, R.Y. (2010). Structure and dynamics of phytoplankton of Southern Baikal (Russia). Intern. J. Algae 12(1), 64–79. doi:10.1615/InterJAlgae.v12.i1.50. Popovskaya, G.I. (1977). Dinamika fitoplanktona pelagiali Bajkala (1964–1974). Biologicheskaya produktivnost' pelagiali Bajkala i ee izmenchivost'. Novosibirsk, Nauka (in Russian). Riquelm, C.E., Fukami, K., & Ishida, Y. (1988). Effects of bacteria on the growth of a marine diatom, Asterionella glacialis. Bulletin of Japanese Society of Microbial Ecology, 3(1), 29-34. Straškrábová, V., Izmest’yeva, L.R., Maksimova, E.A., Fietz, S., Nedoma, J., Borovec, J., Kobanova, G.I., Shchetinina, E.V., Pislegina, E.V. (2005). Primary production and microbial activity in the euphotic zone of Lake Baikal (Southern Basin) during late winter. Glob Planet Chang., 46, 57–73. doi:10.1016/j.gloplacha.2004.11.006. Sherstyankin P.P. (1975) Ehksperementalnye issledovaniya podlednogo svetovogo polya ozera Bajkal. Novosibirsk, Nauka (in Russian). Schloss, P.D., Allen, H.K., Klimowicz, A.K., Mlot, C., Gross, J.A., Savengsuksa, S., ... & Handelsman, J. (2010). Psychrotrophic strain of Janthinobacterium lividum from a cold Alaskan soil produces prodigiosin. DNA and cell biology, 29(9), 533–541. Tamura, K., Stecher, G., Peterson, D., Filipski, A., & Kumar, S. (2013). MEGA6: Molecular Evolutionary Genetics Analysis, version 6.0. Molecular Biology and Evolution, 30(12), 2725–2729. Votintsev, K.K., Meshcheryakova, A.I., Popovskaya, G.I. (1975). Krugovorot organicheskogo veshchestva v ozere Bajkal. Novosibirsk, Nauka (in Russian). Zakharova, Y.R., Adel’shin, R.V., Parfenova, V.V., Bedoshvili, Y.D., Likhoshway, Y.V. (2010). Taxonomic characterization of microorganisms associated with cultured diatoms Synedra acus from Lake Baikal. Microbiology, 79(5), 679–687. doi:10.1134/S0026261710050139.